Start by preparing the achiote sauce. Place a pot on the stove and add the oil. Let the oil heat and fry the annatto seeds on low to avoid splatter. When oil becomes orange in color, remove from the heat and let cool. Strain the oil to remove the seeds and pour in a bowl. Add the seasoning on the list to the oil and stir with a spoon. Add the shrimp to this mixture and cover each shrimp in the sauce. Cook the shrimp in a pan for 2 minutes on each side. The shrimp cooks quickly, so be sure to not over-cook them. Roast the orange slices on both sides in the same pan. To serve, place a bed of spinach on a dish, add one or two orange slices, the shrimp, then the onion and cilantro. Add a bit of vinegar and orange juice as dressing. Serve immediately. You can use achiote paste instead of seeds. My family loves shrimp and seafood in general so I’m always looking for recipes to make at home. Usually I prepare seafood paella recipes, but this time I tried this shrimp in achiote recipe to celebrate our Latin flavors and introduce my family to new seasonings and new ways to cook shrimp. Inspired by the cuisine of the Yucatan Peninsula, achiote is a very popular ingredient used in traditional dishes like cochinita pibil. 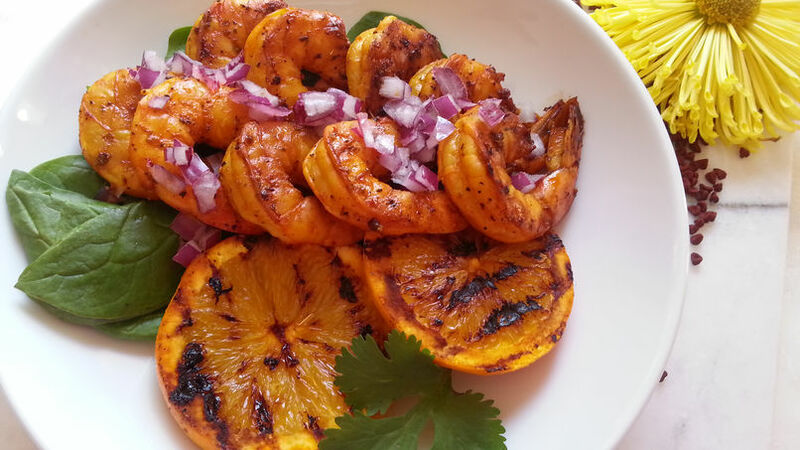 I invite you to try this recipe for shrimp in achiote on the grill to give your family a new and nutritious dinner option. Enjoy!